A lovely translucent emerald crystal mined in Colombia. Beryl is a beryllium aluminum silicate (Be3Al2Si6O18). The three most abundant elements in the Earth’s crust are oxygen (46.6 percent), silicon (27.7 percent), and aluminum (8.1 percent). However, beryllium is one of the least common elements in the earth’s crust. 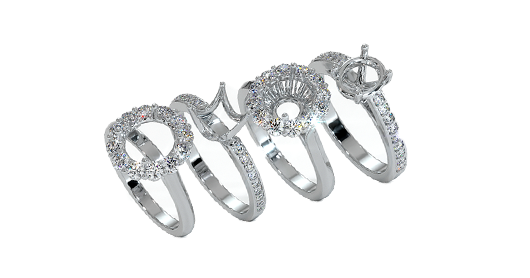 On average, it is estimated that beryllium comprises only 2.8 grams per ton of crystal rock (Sinkankas 1981). There are about forty known beryllium minerals, of which beryl is the most common. 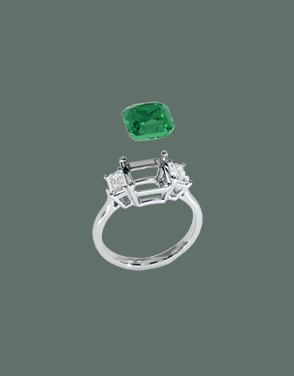 Beryl occurs in each of the rock cycle’s basic rock types: igneous , metamorphic , and sedimentary , but only in very small quantities. The rock cycle is a fundamental geologic principle that describes the dynamic relationships of these three basic rock types. Understanding the rock cycle is key to understanding the various geological conditions that can create emeralds. 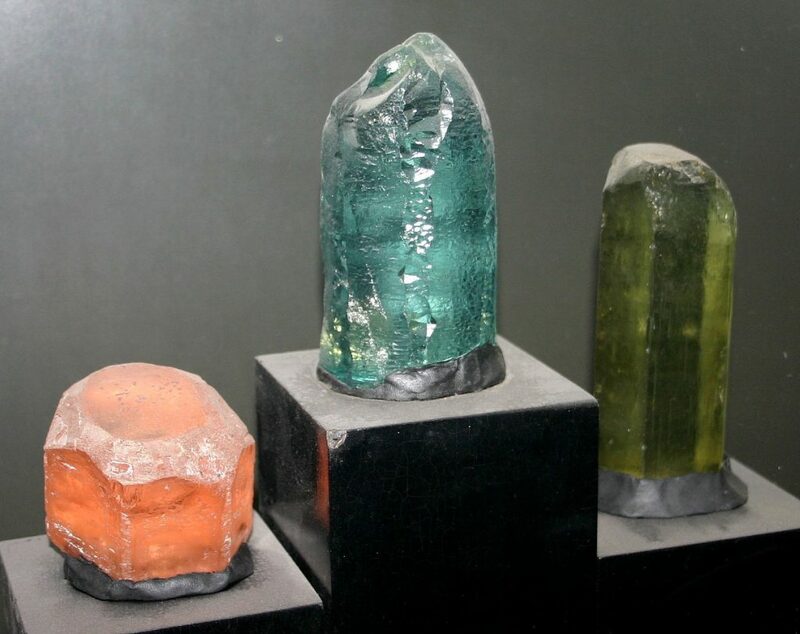 Beryl varieties come in a rainbow of color. 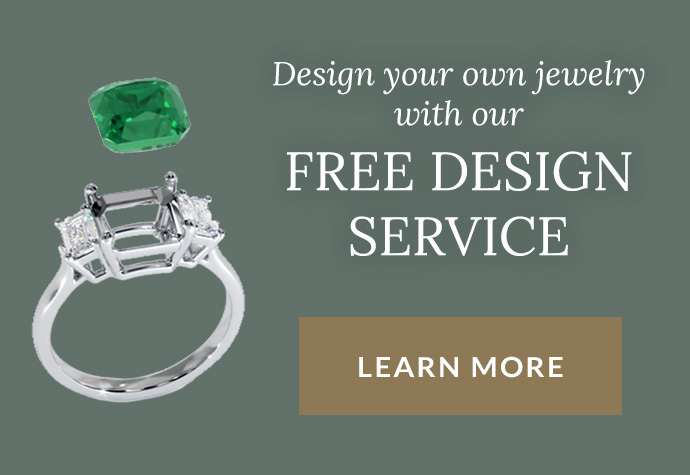 Morganite, heliodore, and aquamarine can all be distinguished from emerald by their color. 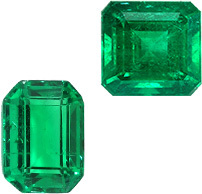 Beryl rough contains minute amounts of chemical impurities called trace elements. 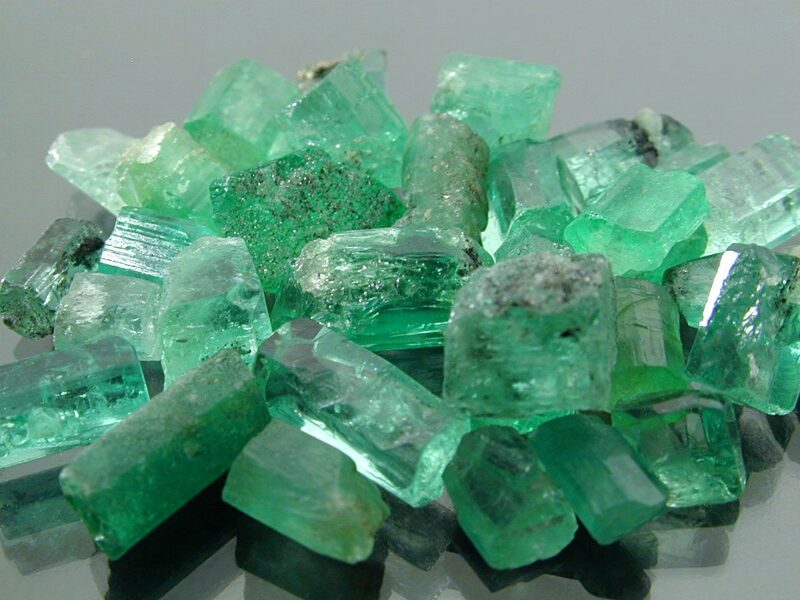 Beryl crystals grow in rapidly changing conditions that affect the type and concentration of trace elements, and in turn, the ultimate color and variety of beryl. Examples of different colors of the mineral beryl. 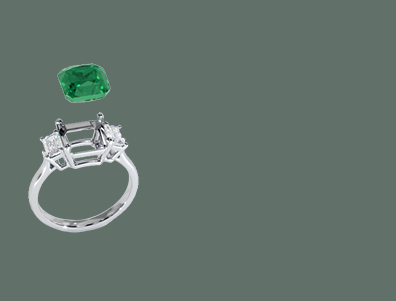 An emerald’s color is caused by the trace elements chromium, vanadium, and iron, which are locked into the stone’s crystal structure. On the other hand for example, aquamarine owes its color to traces of iron, and morganite to traces of manganese. The presence of different trace elements in distinct beryl varieties is linked to the way the varieties form. 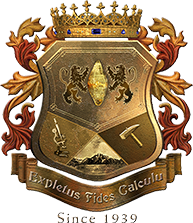 The chemistry and geology of the different beryls are very complex. Sinkankas (1981) lists thirteen basic types of beryl deposits. 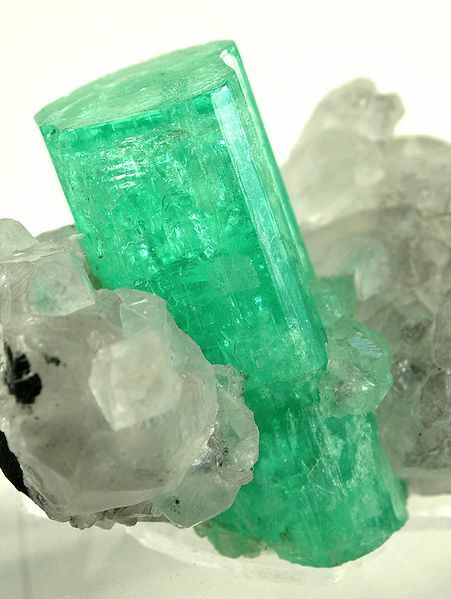 Many beryls, including green beryl, come from pegmatites, which means that the crystals, as well the gemstones cut from them, are often sizeable and relatively free of inclusions . 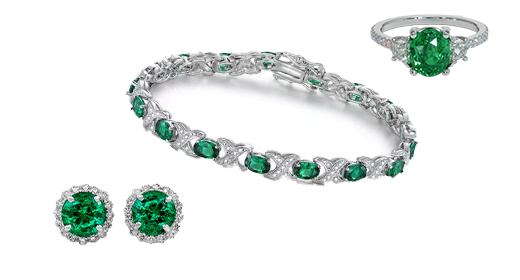 Emeralds form when beryllium, aluminum, silicon, oxygen and one or more of its trace elements come together in the correct geological environment–typically mica schists of metamorphic-hydrothermal origin and sedimentary rock exposed to hydrothermal conditions. Most emerald occurs in dark mica schists of metamorphic origin, including the famous deposits of ancient Egypt and those of Africa, Brazil and Russia. Metamorphism is the transformation of one type of rock to another. Through a process known as exometamorphism, changes are induced in an original rock by the introduction of outside constituents. Emerald crystal forming in a mica schist. In the case of emerald, granitic rocks chemically interact with basic (silica deficient) rocks. During the process, the building blocks of emerald crystals, which are derived from granitic pegmatites, migrate into adjoining or enclosing basic rocks and change them by recrystallizing into host schists. 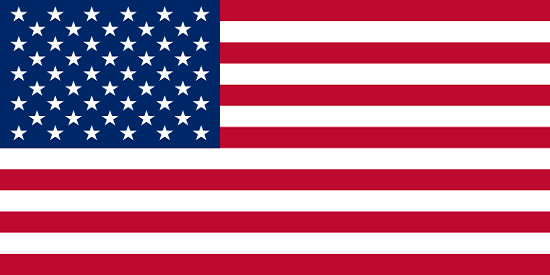 Throughout the world, there are many regions that are known to have granitic rock lying adjacent to basic rock. 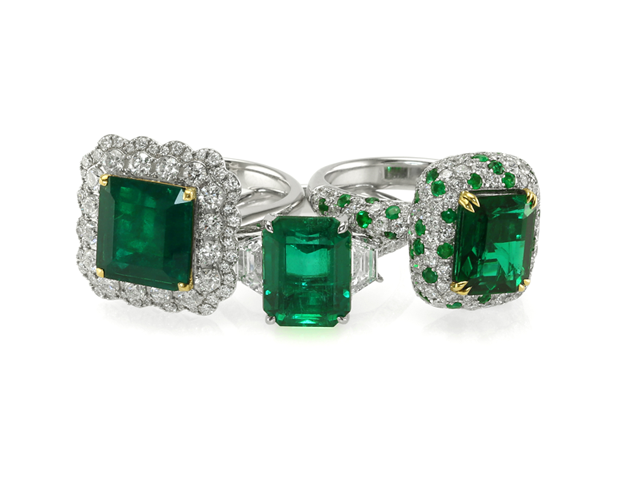 Once these areas are explored, they may reveal many more sources of schist-type emeralds. 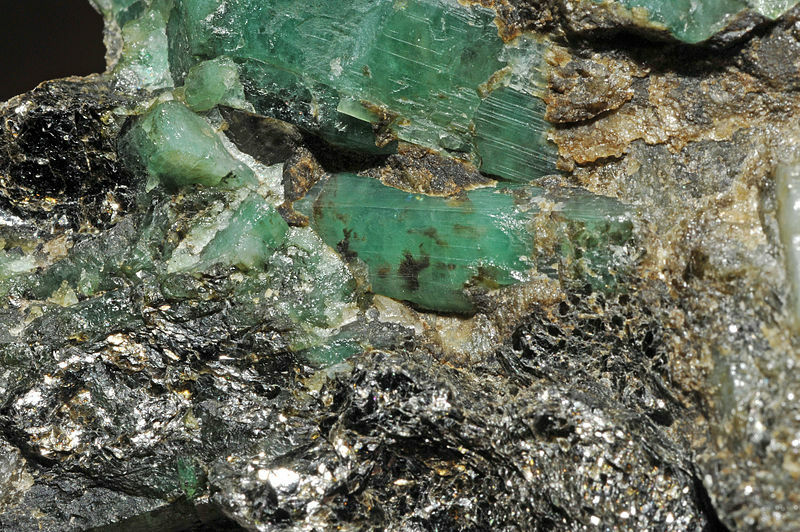 Schist-type deposits are by far the most numerous sources of emeralds, although in terms of size and quality of the emerald crystals, they cannot match the emeralds recovered from hydrothermal deposits. Very hot water vapors escaping from magmas deep in the earth’s crust are known as hydrothermal fluids (from hydro, meaning “water,” and thermal, meaning “hot”). These fluids often carry rare elements, such as fluorine and beryllium, away from the magma via fractures in surrounding rocks and sometimes combine with near-surface water to pick up additional elements. The resulting solutions eventually cool and form mineral veins in the fractures. Under appropriate physical and chemical conditions, these veins may contain gemstones such as topaz, amethyst, benitoite, and emerald. 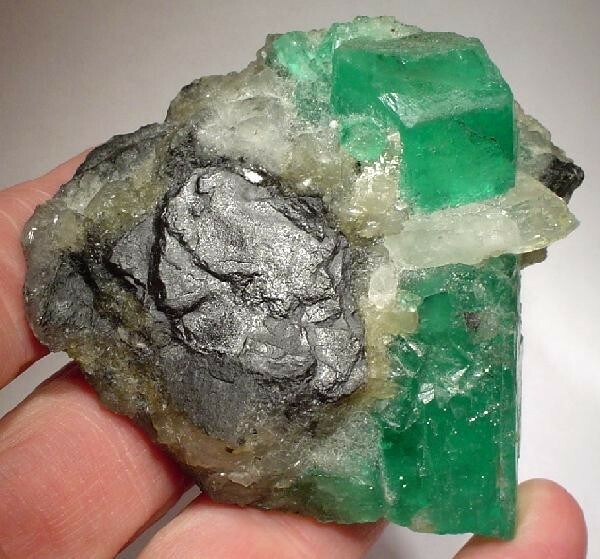 Emerald crystal set in a calcite and shale matrix from Colombia. 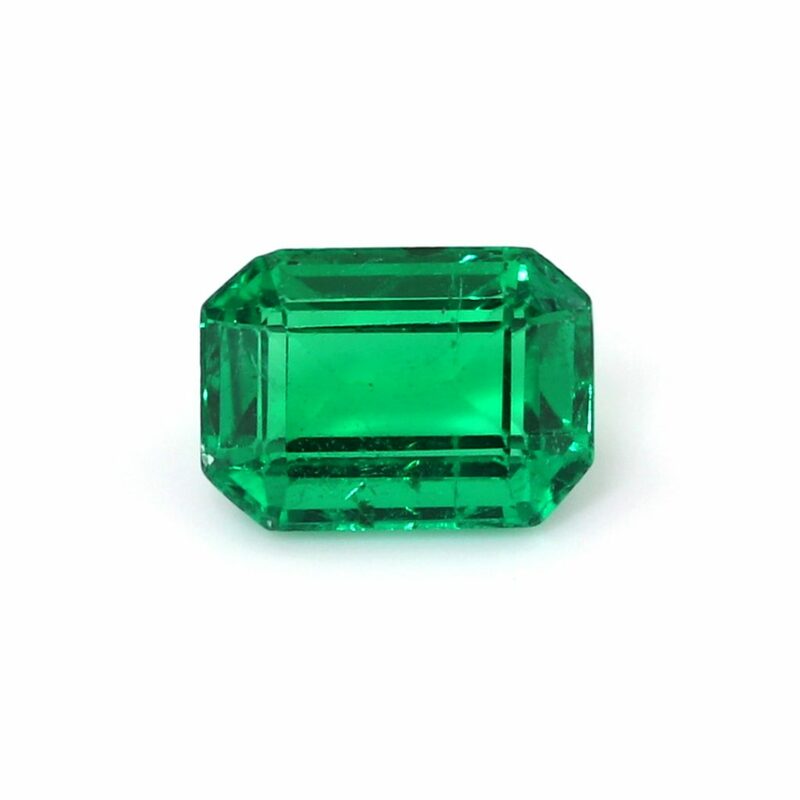 Although hydrothermal gem deposits are found throughout the world, without question, the most important are the deposits of Colombia, which has produced a majority of the world’s finest emeralds. Colombia’s emeralds are formed when layers of sediments buckled and folded forming fault lines. These fault lines provided pathways for hydrothermal fluids to percolate through the rock layers. Because of the way they are formed, hydrothermal emerald crystals are usually larger than emeralds produced by metamorphic means. Although Colombia is far and away the largest source of hydrothermal emeralds, small deposits of this type have also been reported in Afghanistan and Pakistan as well. With an understanding of how beryl crystals, and emeralds specifically, are formed, it is time to dive into a bigger discussion about the role that inclusions play in the beauty and integrity of an emerald on our page Inclusions in Emeralds.